Early shower, then sunny. 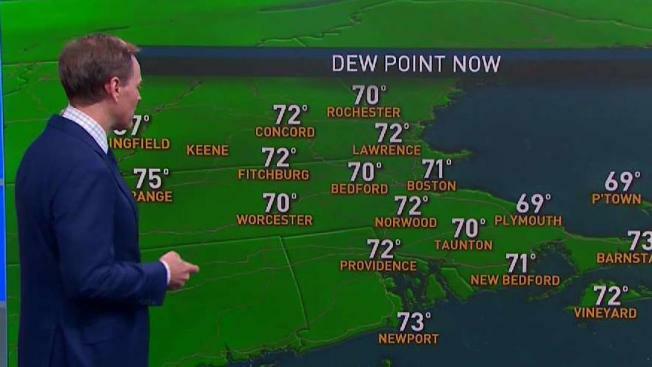 Lowering humidity. Temperatures in the mid 80s. Severe thunderstorm warnings and watches are in effect for parts of New England on Tuesday night. A line of strengthening thunderstorms developed from north of Montreal to near Buffalo New York. The line moved toward the northeast at about 30 mph and arrived in northwest Vermont between 4 and 5 p.m. Already, there have been some reports of damage there. Storms in the watch area may produce severe storms. The line of storms crosses New England from west to east overnight. Storms like this usually weaken after dark, but may still be strong as they move into southern New England overnight. They likely diminish below severe levels shortly after sunset, but still contain gusty winds, heavy downpour,s and lightning when arriving in the Boston area around midnight. This is the leading edge of cooler and drier air that gradually moves into New England over the next few days.